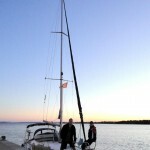 We chartered a Bavaria 34 Cruiser from Ecker Yachting at Punat and sailed south to Zadar. On our first leg, Senjska Vrata showed us a first glimps of what to expect on our way back – we had wind up to 30 knots and waves up to 2m. Marina Rab provided us with some relaxation, showers and a good night sleep. 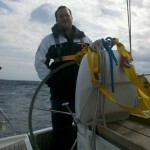 On our second leg we had perfect 10 to 15 knots of wind and sunshine from behind and got all the way to Vir. We fixed the boat on the empty mole and enjoyed the quite town at sunset. 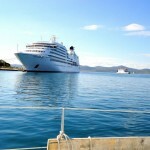 Third leg from Vir to Zadar was short and we had perfect weather and sunshine. We fixed on the empty mole south in the channel and strolled through old town. Enjoyed the ocean organ and the super yachts in the marina. We added our fourth leg to Ugljan the same day. It was a nice summer evening with even some swimming in the bay. Our fifth leg to Jaksinica was covered by clouds and a threat of rain. 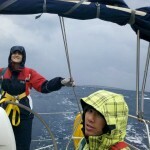 We stayed dry, but the winds picked up to 25 knots and the waves got bigger. 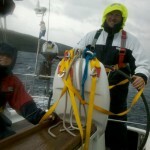 We added some additional ropes to fix the boat for a stormy night. On the next day, thunderstorms and rain showers started and we tried to leave port just when a first wave of heavy rain hit us and we aborted. 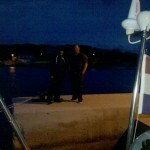 An hour later we tried again and left port for Rab. Half way there heavy rain hit us and just before reaching Rab the edge of the thunderstorm reached us and blew with 35 to 40 knots out of Rab marina. We were struggling to get in and fix out boot. But it worked fine at the end. 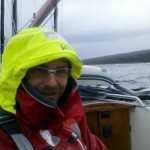 On our last day we expected a calm sail back to Punat. 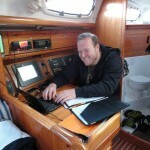 As long as we were covered by Rab we had abour 20 knots wind and no waves. Sunshine and ok temperature. As soon as we left Rabs coast Senjska Vrata’s bora hit us with 35 knots wind – gusts up to 45 knots – and waves up to 3 meters or more. We fought through that crossing for a few hours and were releaved when we reached Punat. 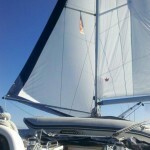 At the end we had a total of 173 nm.